Interest in theories of religion has never been greater. Scholars debate single theoretical approaches in different scholarly journals, while the ‘new atheists’ such as Richard Dawkins and Daniel Dennett criticize the whole idea of religion. For everyone eager to understand the current state of the field, Contemporary Theories of Religion surveys the neglected landscape in its totality. Michael Stausberg brings together leading scholars of the field to review and discuss seventeen contemporary theories of religion. As well as scholars of religion, it features anthropologists, archaeologists, classicists, evolutionary biologists, philosophers and sociologists. Each chapter provides students with background information on the theoretician, a presentation of the theory’s basic principles, an analysis of basic assumptions, and a review of previous critiques. Concluding with a section entitled 'Back and Forth', Stausberg compares the different theories and points to further avenues of discussion for the future. Michael Stausberg is Professor of Religion at the University of Bergen (Norway). 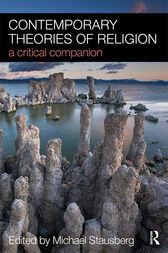 Recent publications include Zarathustra and Zoroastrianism (2008) and Theorizing Rituals (co-editor, 2 vols. 2006-2007). Stausberg is the European editor of the journal Religion.